Studies show that people who eat the most fruits and vegetables enjoy healthier and longer lives, but getting the recommended five servings a day is difficult for even the healthiest diets. That’s why we created Life Extension Mix™, a daily supplement that provides all the high-potency vitamins, minerals, and amino acids needed to form the cornerstone of a comprehensive health maintenance program. Our unrivaled formula saves time and money by combining the most important nutrients ? including unique vegetable, fruit, and botanical extracts ? into one product, eliminating the need to take dozens of separate supplements. For true full-spectrum nutrition, try Life Extension Mix™ ? the most complete multi-nutrient formula on the market! You hear it almost every day from government health agencies and private organizations: Americans need to eat more fruits and vegetables in order to live longer. However, despite constant media publicity, the majority of Americans do not ingest enough fruits and vegetables each day. In fact, a John Hopkins study found that only 28% and 32% of American adults met the United States Department of Agriculture (USDA) guidelines for fruit and vegetable intake respectively.1 ? Found in dark red fruits, delphinidins are potent anthocyanin compounds that activate the production of nitric oxide, enabling vascular relaxation and supporting healthy blood pressure.1?4 They can also help to ease inflammatory factors5?8 and glycation,9 stimulate the immune system, and maintain healthy blood sugar levels within normal range, which helps to control metabolic balance. 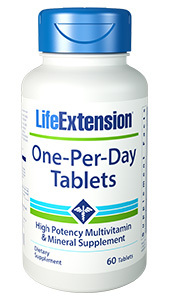 With Life Extension Mix™, you get the same amount of delphinidins found in 3? cups of raspberries or 5? cups of dried plums. To combat these effects, each daily dose of Life Extension Mix™ provides 100 mg of the expensive pyridoxal 5′-phosphate ? a metabolically active B6 that has been shown to protect against glycation reactions.29-31 ? Published studies show that pomegranate helps maintain healthy cardiovascular function32-37 and healthy DNA structure in prostate cells.38-43 Our pomegranate extract is standardized to provide the biologically active punicalagins that are so unique to this fruit. These punicalagins are 100% water-soluble, have a remarkable 95% absorption rate,44 and are highly potent at inhibiting free radicals.45 That means that they not only absorb much better than other natural antioxidants, but they also have a superior antioxidant capacity. A daily dose of Life Extension Mix™ provides the punicalagins and other polyphenols found in up to 2.6 ounces of pomegranate juice. The potent natural antioxidants blueberry anthocyanins have demonstrated properties that extend well beyond inhibiting free radicals, while blueberry’s active constituent (pterostilbene) promotes healthy lipid and glucose levels for those already within normal range.46-49 Even more exciting is that these blueberry constituents (pterostilbene and anthocyanins) may help protect DNA structure.50-54 Life Extension Mix™ features the wild blueberry extract that provides the most active constituents found in this health-promoting fruit. In addition to our standardized pomegranate and wild blueberry extracts, Life Extension Mix™ also features fruit extracts such as bilberry, grape seed, and citrus bioflavonoids to provide healthy circulation throughout the body and maintain healthy DNA. Our unique formula is fortified with maqui berry and tart cherry for their antioxidant benefits for heart health as well as muscle and joint function.129-148 It also includes a customized blend of blackberry, cranberry, plum, elderberry, persimmon, cherry, and other fruits that studies indicate provide multiple favorable effects on the body. Sesame and its lignans have a broad range of applications in human health, including increasing human tissue levels of gamma tocopherol,162,163 enhancing the beneficial effects of fish oils, and helping to maintain already-normal cholesterol/LDL levels in humans.164-173 Life Extension Mix™ provides 10 mg of a sesame lignan extract to supply the direct benefits of the lignans and to augment the effects of vitamin E174 and other nutrients in the body such as gamma-linolenic acid (GLA). Folate helps maintain homocysteine levels within the normal range. One dose of our formula contains 400 mcg of the bioactive 5-MTHF form of folate, which is up to 7 times more bioavailable than ordinary folic acid. 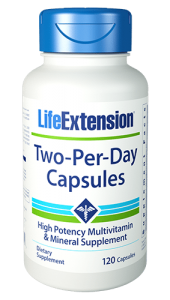 Life Extension Mix™ now contains three potent forms of selenium (SelenoExcell?, Se-methyl-selenocysteine, and sodium selenite). Also newly included is apigenin, a powerful bioflavonoid found in many vegetables and fruits which boosts cell protection. 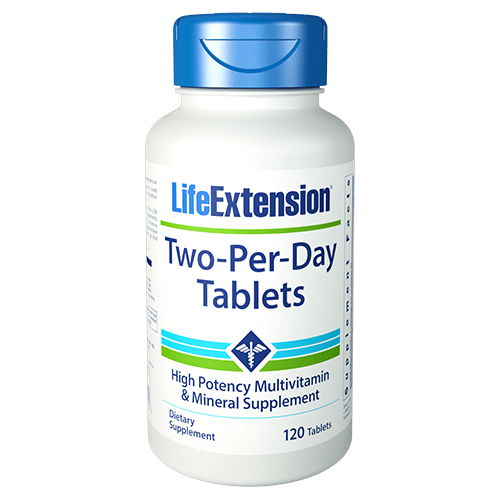 Why choose Life Extension Mix™ for your multi-nutrient supplement? The ingredients in Life Extension Mix™ are based on over 35 years of clinical research, and we’ve selected the purest and most potent forms of plant extracts, vitamins, minerals, and other nutrients for maximum absorption. 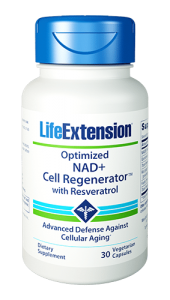 We mandate that the ingredients in the Life Extension Mix™ come only from premium-quality suppliers. These premium companies charge more for their vitamins and trace elements, but the purity of these substances greatly exceeds that of the lower cost generic versions that are so prevalent in the vitamin industry. Most multivitamin formulas only pay lip service to the ideas of full-spectrum nutrition, but Life Extension Mix™ is different. 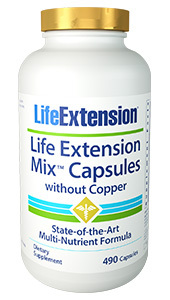 Discover the extensive benefits of Life Extension Mix™ ?? the only multi-nutrient formula you’ll ever need! Ratings based on results of the 2017 ConsumerLab.com Survey of Supplement Users. Other ingredients: gelatin (capsule), microcrystalline cellulose, vegetable stearate, silica, maltodextrin, medium chain triglycerides. 2- Delphinol® is a registered trademark of MAQUI NEW LIFE S.A., Chile. 3- OptiZinc® is a registered trademark of InterHealth Nutraceuticals, Inc.
8- Tomat-O-Red® is a registered trademark of LycoRed LTD.
10- pTeroPure® is a registered trademark of ChromaDex, Inc., Patents: See www.ChromaDexPatents.com. 11- MirtoSelect® is a registered trademark of Indena, S.p.A., Milan, Italy. Take fourteen (14) capsules per day in divided doses with meals, or as recommended by a healthcare practitioner. Temporary flushing, itching, rash, or gastric disturbances may occur. Liver function testing is recommended when niacin is taken in excess of 500 mg daily. Those with gout or liver diseases should avoid taking high doses of niacin. Consult with your doctor before using this product if you are taking anticoagulant medications. Individuals consuming more than 2,000 IU/day of vitamin D (from diet and supplements) should periodically obtain a serum 25-hydroxy vitamin D measurement. Vitamin D supplementation is not recommended for individuals with high blood calcium levels.